A two-year-old boy from Dongguan in China narrowly escaped death when he blindly followed his brother. 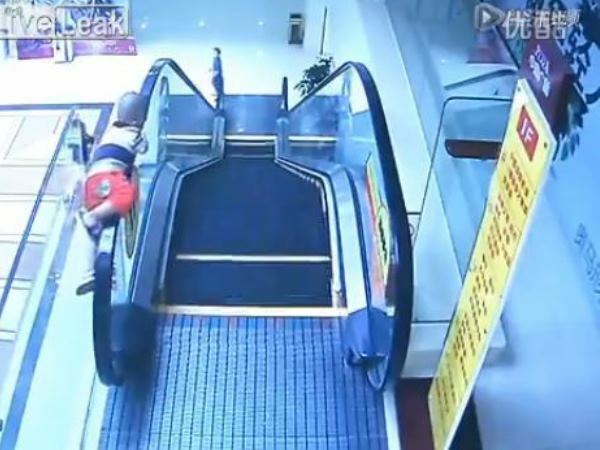 Video footage from the shopping centre’s security cameras shows the boy following his brother who’s on his way down an escalator. But things go badly wrong. As the boy grabs the railing he’s suddenly pulled upwards. For a few moments he manages to keep his grip – but then he falls down two storeys. People rushed to the boy’s aid and shortly afterwards medical personnel took him to hospital. He miraculously survived the fall of more than 9 m and is recuperating in hospital.